Ireland went down to a four-wicket defeat on Saturday in the first of two T20 warm-up games against an Oman Development XI. It was Paul Stirling’s first match as the Irish T20 captain but he was out for eight as the tourist slumped to 47-6 at the 10-over mark. 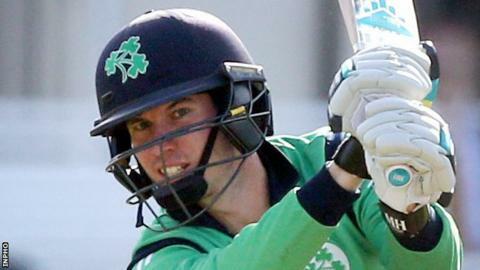 George Dockrell’s unbeaten 26 helped Ireland to 112-8 from their 20 overs. Suraj Kumar’s unbeaten 56 off 41 balls laid the foundation for the host as they reached 116-6 in just 15.2 overs. Harry Tector made his senior Ireland debut although he only managed three runs before being dismissed. The sides meet again on Sunday at the Al Amerat Cricket Ground before Ireland face Oman, Scotland and the Netherlands in T20 Internationals next week. “It was a tough start but it was just nice to get out on to the cricket field and get the team together after four months of being away – and that’s how it panned out as well,” said Stirling. “We can only really improve from what happened today. We need to get out there again and show what we’re capable of on Sunday. “With the batting, I think it is just a case of being indoors for the winter. We were hitting a lot of the fielders, and the ones we did manage to hit well went to boundary fielders and were caught. “So we need some tidying up on that and to work hard in the nets to make sure that we’re not just going through the motions. Paul Stirling (Captain), Andrew Balbirnie, Peter Chase, George Dockrell, Shane Getkate, Josh Little, Andrew McBrine, Kevin O’Brien, Stuart Poynter, Boyd Rankin, Simi Singh, Harry Tector, Stuart Thompson, Lorcan Tucker. Paul Stirling (Captain), Andrew Balbirnie, Peter Chase, George Dockrell, Shane Getkate, Josh Little, Andrew McBrine, Kevin O’Brien, Stuart Poynter, Boyd Rankin, James Shannon, Simi Singh, Harry Tector, Stuart Thompson, Lorcan Tucker. William Porterfield (Captain), Andrew Balbirnie, James Cameron-Dow, Peter Chase, George Dockrell, Andrew McBrine, Barry McCarthy, James McCollum, Tim Murtagh, Kevin O’Brien, Stuart Poynter, Boyd Rankin, Simi Singh, Paul Stirling, Lorcan Tucker. William Porterfield (Captain), Andrew Balbirnie, James Cameron-Dow, George Dockrell, Andrew McBrine, Barry McCarthy, James McCollum, Tim Murtagh, Kevin O’Brien, Stuart Poynter, Boyd Rankin, Simi Singh, Paul Stirling, Stuart Thompson, Lorcan Tucker.